Twenty-four exceptional singers enjoy a diverse repertoire and an annual tour as members of the NSU Chamber Singers. 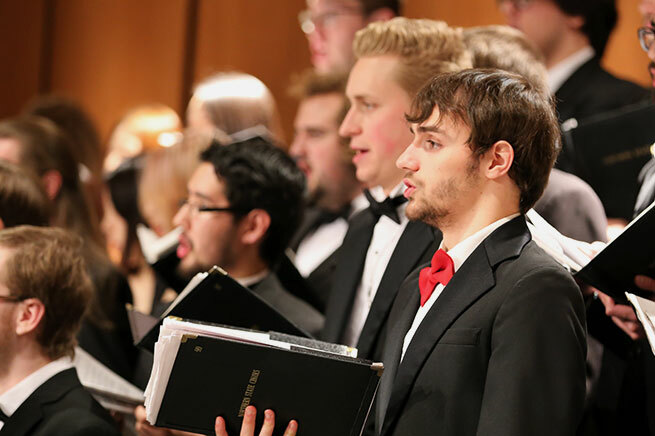 Performing a capella and accompanied works, chamber singers rehearse two hours per week and perform in wonderful acoustic spaces on and off campus. Chamber singers tour with the NSU choir each fall. Potential performers audition with Dr. Woods at the beginning of the semester. Sight reading is a skill necessary to succeed in Chamber Singers. Join the 130 members of the NSU Concert Choir and perform repertoire from the renaissance to today. The choir rehearses 3 hours per week, performs on and off campus, and tours each fall. Formal attire is required for concert and tour performances. Tuxedos are available from the music department. Men are required to purchase a formal tuxedo shirt and tie. Women are required to purchase a formal black dress from the Fine Arts office. Potential performers audition with Dr. Woods at the beginning of the semester. Your enthusiasm and willingness to work will lead to success in Concert Choir. Performing a varied repertoire representing many styles and time periods, the NSU Concert Band is open to all students and community members. The band rehearses Monday evenings, culminating with a performance at the end of each semester. Students may register for 0 or 1 credit hour. Interested in being a member of the award-winning NSU Marching Wolves? Email Dr. Terry Beckler (above) for more information. For current updates and announcements, check us out on Facebook. 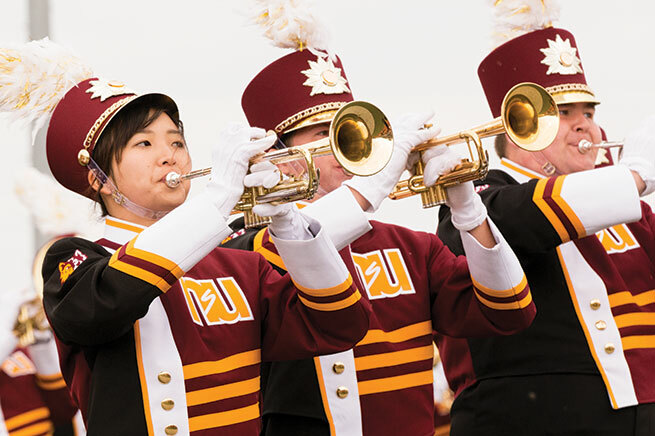 The NSU Symphonic Band is the premier auditioned band at Northern State University. With approximately 60 members, the band performs a complete repertoire of literature from transcriptions to contemporary works. The band is comprised of students representing many different majors. The band rehearses three hours per week and performs a minimum of three on-campus performances each year. The band tours each spring, and has been featured at the South Dakota Music In-Service and North Dakota Music Educators conferences. The band has completed a four-city tour of China and was selected to represent South Dakota in a performance at the Kennedy Center for the Arts in Washington, D.C. The Dominant 7 features the finest trumpet studio in the Midwest. Six trumpets, a trombone, and a hot rhythm section are sure to impress. They play big band swing, straight-ahead bebop jazz, blues, funk, dance standards, Latin jazz, some favorites from the Dirty Dozen Brass Band, and even an all-trumpet rendition of polkas! The Dominant 7 has entertained thousands from Indiana to Montana since they created themselves in 2004. They have been featured on stages in Wisconsin, the South Dakota State Fair, The Sioux Falls Jazz and Blues Fest, and many others in Aberdeen and surrounding area. They opened for Arturo Sandoval at the International Trumpet Guild conference in Glassboro, N.J., in 2006, and performed with the rhythm section of the Army Blues at the International Trumpet Guild conference in Harrisburg, Pennsylvania. Their sound is original and unique, featuring fine young trumpet artists from Dr. Grant Manhart's trumpet studio at Northern State University and backed by a rhythm section. You won't be able to sit still when the group lays down the groove! The 50-member Aberdeen University/Civic Symphony (AUCS) performs 3 full orchestra concerts per season plus the fall musical and other concerts. 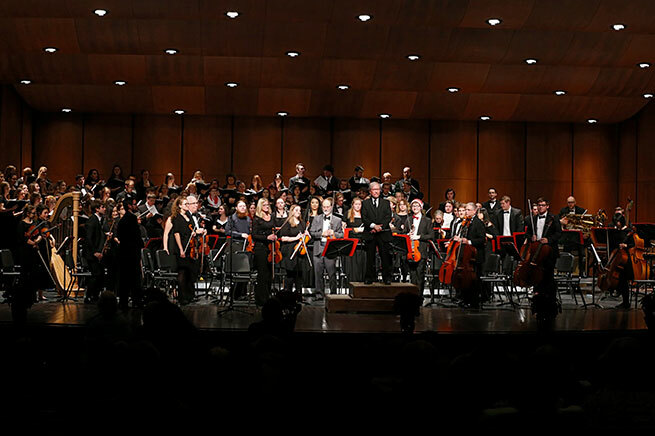 The AUCS provides an exciting and rewarding experience to NSU students and community musicians who are interested in performing great orchestral music. The history of the orchestra reveals the importance of featuring the rich talent of the area together with superb guest artists. The AUCS has been a focal point of musical life in Aberdeen for more than a century. It was founded as the Normal Orchestra prior to 1910 under J.J. Cason, and became a college-community orchestra in 1920 under Howard Elson Goodsell. Dr. Christopher Stanichar became the orchestra's 17th conductor when he joined the NSU faculty in the fall of 2018. For more information about the AUCS or tickets for orchestra concerts, contact the NSU Fine Arts Office at 605-626-2497. The Two O'Clock Jazz Ensemble is the premier jazz ensemble at Northern State University. With approximately 18 members, the band performs a wide variety of jazz repertoire and tours each winter throughout the region. 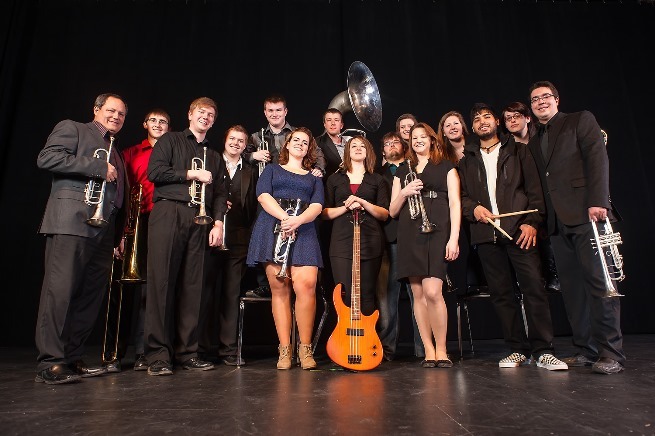 The band performs two hugely popular swing dance events, one in the fall and one in the spring; performs a spring concert; and hosts nationally known artists each year in January at the South Dakota Jazz Festival. The NSU-VJE (Vocal Jazz Ensemble) is comprised of 12 singers, a 3-4 member rhythm section, various other instruments to round out the band, and a sound tech. VJE performs the best of vocal jazz charts for its own Sweet Jazz event each spring and dance standards for swing dances each semester. NSU-VJE also is the host vocal ensemble for the South Dakota Jazz Festival in January. The ensemble rehearses every Wednesday and Friday. Interested students audition with Dr. van Gent at the beginning of the fall semester, after a successful general choral audition with Dr. Timothy Woods. Sight reading, a cappella singing, and stage presence skills are necessary to succeed in NSU-VJE. To audition for the NSU Vocal Jazz Ensemble, students first complete the initial choral audition with Dr. Woods during the first week of school (see posted information by the choir room). Students invited back to audition for Chamber Choir will also be eligible to audition for VJE. Students access the "Summertime" audition piece and YouTube audio accompaniment under "VJE Audition Links" on myNSU. The Wolfpack is a 15-25 piece elite pep/jazz/cheer ensemble designed to learn and perform current and past pop/jazz music, inspire the crowd, and spur Northern teams to victory! Wolfpack members are paid for each game at which they perform. The band receives a lump sum from the Student Budget Committee, which is divided equally among the band members. The band rehearses two hours before the first home basketball game in JFAC. One hour before the tipoff, usually near the end of the women's game, the band reports in uniform: a Wolfpack shirt supplied by the band and khaki pants. The games generally begin at 7:30 pm. Interested performers should arrange for an audition with Dr. Manhart before the season starts. Musicians in this band must have a fine sound and an eager and enthusiastic approach to band and athletics. The ability to improvise is a definite plus. The only woodwind instruments on the paid Wolfpack list are alto, tenor and baritone saxophones. All the brass instruments are included as well as one drumset player, one keyboard player, one electric bassist (all with jazz skills) and one or two auxiliary percussionists. NSU offers a variety of educational opportunities for percussionists desiring a degree in music. Applied studio lessons are tailored to each student's needs and/or desires. The goal is for students to have exposure to all areas of the percussion family, and ultimately gain proficiency on each instrument. Northern offers a variety of ensembles that employ percussionists. Membership is determined by audition, but each ensemble is open to students of any major. Percussion Methods is offered for music education majors.